Triumph’s efforts at reinventing the Bonneville platform (which includes the Street Twin and Thruxton along with the T120 Bonneville) deserve huge kudos. It’s one thing to create a terrific new motorcycle that meets contemporary emissions and performance standards, but it’s another to do so while making the bikes look almost like they stepped out of a showroom from 50 years ago. 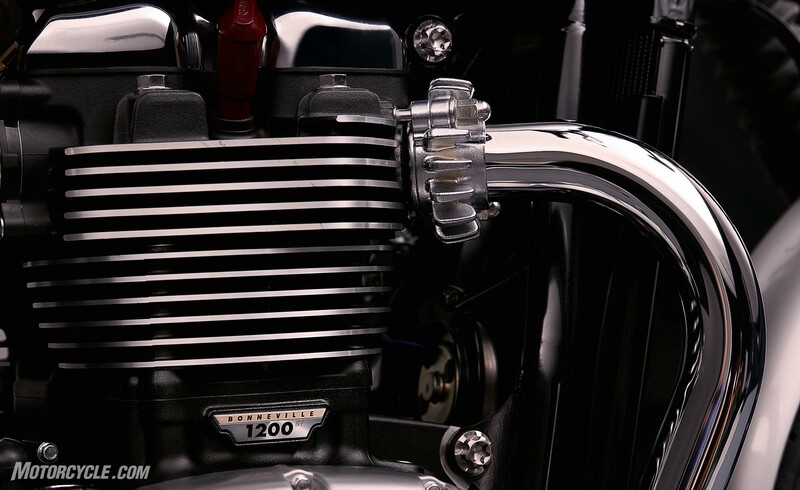 They appear more authentically retro than the previous air-cooled generation, which is a massive accomplishment for bikes with contemporary liquid-cooled motors. Redesigning this platform from the ground up was obviously a massive undertaking for Triumph, and all those efforts are proudly on display from first look to first ride. The fit and finish is excellent and makes us think that manufacturing the bikes in Thailand isn’t much – if any – of a penalty relative to building them at Triumph’s home base in England. Not only does the trio work well on the road, they also have a way of connecting emotionally with riders, helping bridge the gap back to Triumph’s historic glory years while never leaking oil or hatching the old Prince of Darkness electrical issues of bygone Lucas equipment. We were highly impressed with the new Bonneville after riding it at its launch, and its sister, the new Thruxton, proved to be more exciting than expected from this air-cooled-appearing parallel-Twin platform. The Street Twin lies at the lower end of the lineup, but it also has stellar attributes and soundly trounced its rivals in this shootout. 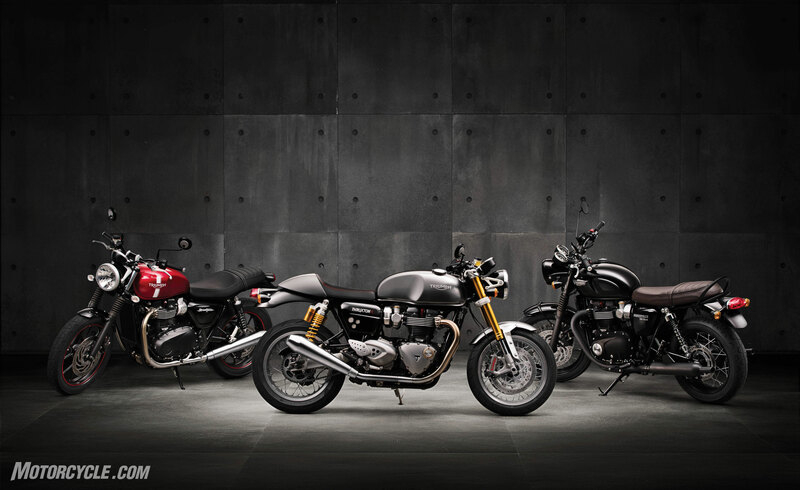 Amazingly, each of these new Triumphs has a personality distinct from the others. The Street Twin is a classy and eminently manageable roadster, earning our Best Standard MOBO this year for its appealing coolness-per-dollar ratio. The Bonneville is a carefully manufactured modern icon that’s faster and better handling than the outgoing Bonneville without any gauche indication of its increased performance. The Thruxton is the cafe-racer version of the standard Bonneville with lower handlebars and the “High Power” version of the Bonnie’s parallel-Twin, looking the part of a ’60s-era cafe bike right down to its tank strap and Manx-style fuel cap. This impressive new platform is of critical importance to Triumph’s future success, and not just because of these three bikes already on offer. There’s also a 900cc Bonneville T100 and Street Cup still on the way, not to mention the upcoming Scrambler. So, for the significance to Triumph’s long-term strategy and for their inevitable impact on the market, this new lineup of retro roadsters deserves our recognition as the most important additions to the world of motorcycles in 2016. MO’s love for the Tuono goes back more than a decade, as it was love at first ride when we caned it in 2002. It was exactly what we had hoped for from a naked and upright superbike – with the full monty of performance, not detuned and decontented like its period rivals. And that formula continues to reap dividends for Aprilia, as the V-4 Tuono 1100 proves to be one of the best sporting motorcycles ever created. And we can say that confidently because we’ve put Tuonos to the test time after time after time. It slapped down a Speed Triple and MV in a 2012 comparison, and declaring our 2014 streetfighter champ had to wait until we were able to include a Tuono against BMW’s S1000R and KTM’s Super Duke, both which had previously vanquished other class rivals. 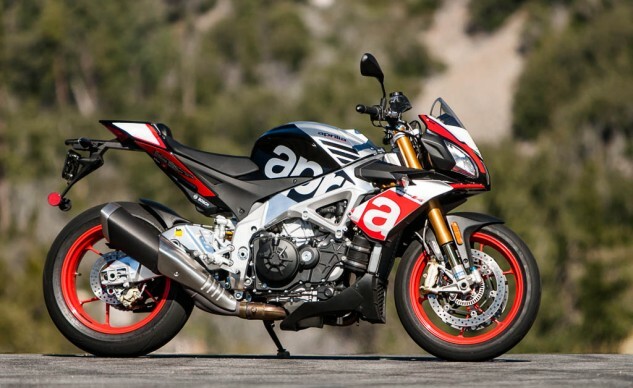 The Tuono came up short that time around, but Aprilia gave it several significant upgrades the next year, forcing a rematch with the KTM, which had become our 2014 Motorcycle of the Year because of its stunning combination of accommodating ergonomics mixed with incredible performance and versatility. The shootout linked above between the $17,399 KTM and the $17k Tuono Factory couldn’t have been closer, with less than one-tenth of 1% between them in our scorecard. The Tuono gets the nod over the KTM on balance because it’s also available in $14,800 RR form, which has nearly equal performance to its high-end brother. Thrilling on the street, it’s also almost surely the quickest bike among streetfighters around a racetrack. 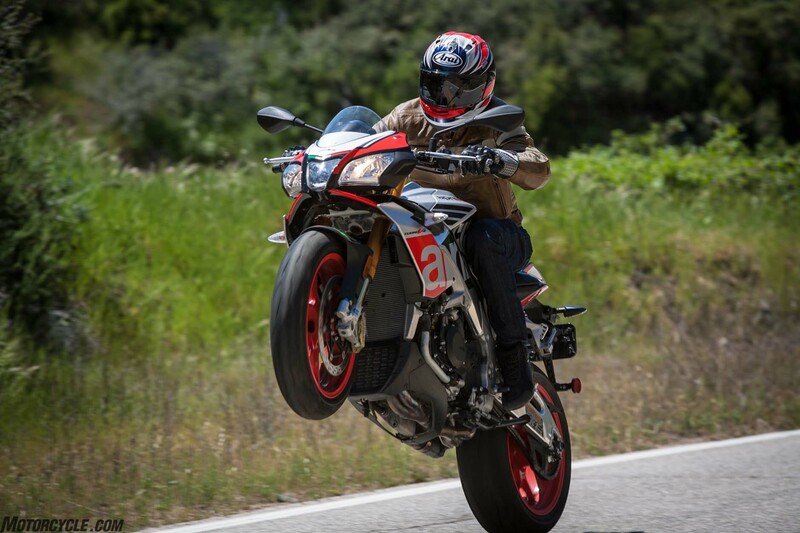 More recently we had the good fortune of riding a Tuono Factory with other naked sportbikes to Monterey and back for the World Superbike races at Laguna Seca. We feared the Aprilia’s hard edges would’ve started cutting after three long days on the road, but the highly engaging Italian thunder always had a line of very willing participants who wanted yet another crack at it, and it scored highest among our editors despite being docked points for its higher price. The updates in 2015 made the Tuono more comfortable and usable while raising its performance bar to stratospheric levels. There are dozens of reasons to love the Tuono, but every conversation about it will include loving, yearning descriptions of one of the best and most soulful powerplants ever bolted between two wheels. Its V-4 sings an operatic MotoGP tune that surely brings a tear to the eyes of Honda engineers who were assigned to build nice parallel-Twins instead of another fierce V-4. Just the sound of its ignition is enough to increase a gearhead’s heart rate, and it just keeps getting better as it stretches for its 160 horsepower and 12,000 rpm. In fact, its 1077cc mill is vastly superior in street situations to any liter-sized sportbike motor, with the Tuono punching out power sooner and deeper. We all really appreciate when a sportbike not only ticks all the typical sportbike boxes but also inflames desire in our hearts and in our dreams. 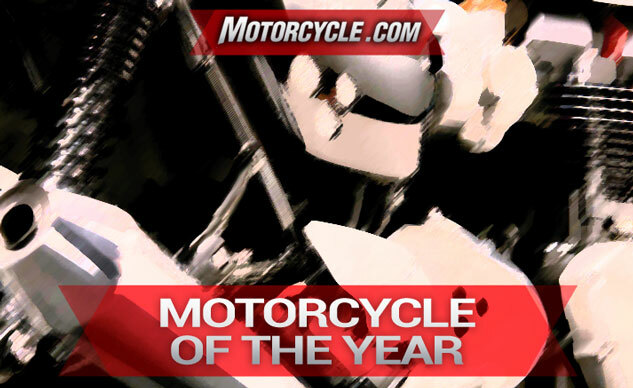 That’s why it’s our 2016 Streetfighter/Hooligan of the Year, and why it nearly won our Motorcycle of the Year. We can’t get enough of this wonderfully wicked ultra-fighter, and it inspires lustful thoughts of ownership. That’s a genuine endorsement from the MO crew.